MONTREAL - Hydro-Québec says a power outage affecting Montreal is connected to an underground explosion and a fire in a manhole in Rosemont—La Petite–Patrie. 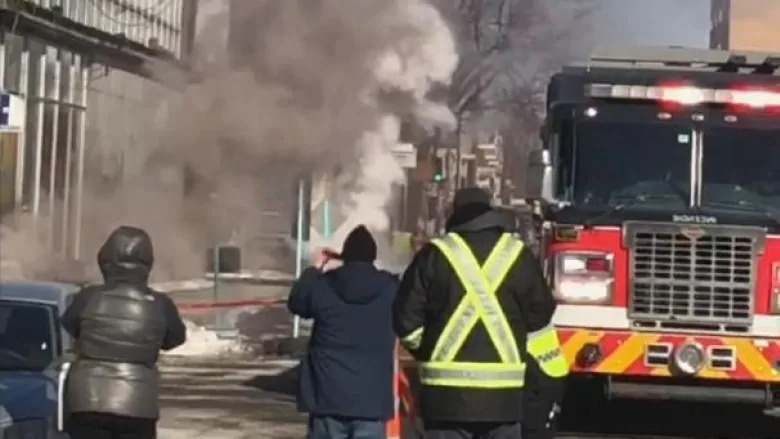 The fire started in underground pipes belonging to Hydro-Québec on Bélanger Street between Boyer and Saint-André streets, according to Montreal firefighters, who arrived on the scene at 12:18 p.m. The electricity had to be cut so that firefighters could get into the manhole where the equipment was located. At the peak of the shutdown, nearly 41,000 customers were without power. As of 7:00 p.m., 10,981 clients still had no power. Hydro-Québec spokesperson Louis-Olivier Batty said the utility is being strategic about how it restores power. Because of the cold, it anticipates that people will crank up the heat as soon as they get their electricity back, and that could trigger an overload somewhere else on the network, Batty said. The Metro's Blue line was down much of the afternoon, but the STM announced the line was back up and running just after 4:30 p.m.
Bélanger Street was blocked to traffic much of the afternoon, however, it has now been reopened. Batty said once the smoke clears, Hydro-Québec workers will take a look at the equipment to see what failed.